USC ranks highly among U.S. medical schools for its basic science and clinical research. The Department of Medicine is one of the leading contributors to both basic science and clinical research at the Keck School of Medicine. Many house officers participate in the active research efforts of our faculty. To foster and promote the development of those individuals anticipating academic careers, house officers may participate in research blocks in which they can perform faculty supervised research. 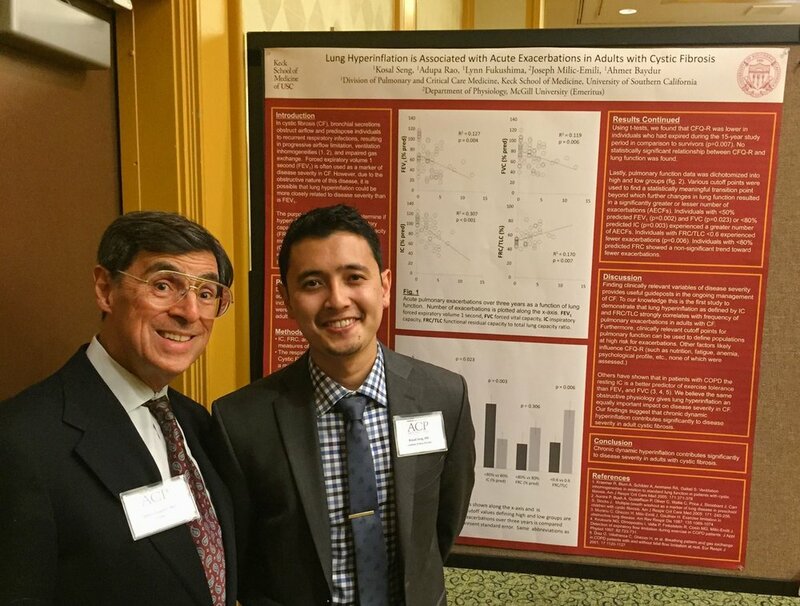 USC residents participate in a wide variety of research projects, present their findings at prestigious national and international conferences, and publish their manuscripts in highly visible journals under the guidance and mentorship of our faculty. Below is just a sample of the posters, presentations, and manuscripts published by our residents during their training at USC. Kita K, Rusia A, Shah S, Zhang Y, Roy D, Nattiv J, Doshi N, Tun H, Clavijo LC, Doshi RN. Does Stroke Risk Influence the Decision to Anticoagulate Post Percutaneous Coronary Intervention Patients With Atrial Fibrillation: A review of 3850 Patients. American College of Cardiology: Annual Scientific Session. March 17-19, 2017; Washington, DC. Xu PX, Rossetti G, Shavelle DM. Subtleties of failed compaction in a failed heart. European Society of Cardiology EuroPCR Conference. May 16-19, 2017; Paris, France. Cho SH, McLeod J, Yau S, Singh, N, Hindoyan A, Hutcheon D, Coffey C. LAC+USC Telemetry Transformation Initiative. 2017 Telluride Patient Safety and Quality Conference. Telluride, CO.
Sattler M, Jones E, Clavijo L, Mehra A, Hindoyan A, Matthews RV, Tun H, Shavelle DM. Gender differences in patients undergoing percutaneous coronary intervention for acute myocardial infarction at a safety net hospital. CRT-2017. February 18-21, 2017; Washington, DC . Buxbaum JL, Ko C, Yu CY, Jayaram P, Lee T, Patel S, Sahakian A, Hou LA, Shue DS, Laine L. Randomized Trial of Cholangioscopy-Guided Laser Lithotripsy vs Conventional Endoscopic Therapy for Large Bile Duct Stones. Digestive Disease Week 2017. Chicago, IL. Zhang B, Hwang C, Sheibani S, Tran-Minh ML, Allez M, Shao L. Pilot study: Selective deglycosylation of terminal sialic acid on infliximab increases binding of antibodies to infliximab (ATI) in ATI-positive inflammatory bowel disease (IBD) patients. Digestive Disease Week 2017. Chicago, IL. Yen CF, Patel P, Vargas J, Zia SK. Resident attitudes towards medical education curriculum at a university-affiliated medical center. 2016 Innovations in Medical Education. February 19, 2016, San Gabriel, C.
Hsiao M, Kogan M. Investigating the Therapeutic Effectiveness of Dogs Present in the Adult Outpatient Primary Care Setting. Academy of Integrative Health and Medicine (AIHM) Annual Conference. October 30 - Nov 3, 2016; San Diego, CA. Pow-anpongkul P, Rossetti G, Marks J. Calciphylaxis Can Affect More Than Just Skin: a Case of Pulmonary Calciphylaxis. Society of General Internal Medicine. California-Hawaii Regional Meeting. January 2017; Los Angeles, CA. Kang I, Kim D, Park MM, Siddiqi I, Tupule A, Mohrbacher A, Ailawadhi S, Kelly K. Racial/Ethnic Disparities in NK/T-Cell Non-Hodgkin Lymphomas in the US: A SEER Analysis. The American Society of Hematology. San Diego, CA. 2016 December. Morado A, Moore J, Ahmadi T, Singh W, Balekian A. Flexible Bronchoscopy with Transbronchial biopsy is associated with increased yield and increased complications in Hematology/Oncology Patients. American Thoracic Society, Washington DC May 2017. Coronel S, Allam S, Ganesh S, Wafaa E, Garon B, Wilcox A, Latterman P, Liebler J, Barbers R, Floreth T, Baydur A. Lung function in patients with chronic allograft dysfunction (CLAD) following lung transplantation: Patterns of decline. American Thoracic Society International Conference, Washington DC May 2017. Al-Asady NA, Dhillon AS, Burton KR, Toubat O, Schwartzman WS, Doshi RN, Matthews RV, Clavijo LC. Left Atrial Appendage Occlusion for Atrial Fibrillation: Eligibility in a Typical Oral Anticoagulation Clinic. J Am Coll Cardiol Intv. 10(3_S):S75, 2017. Wadia SK, Belkin M, Chow KS, Nattiv J, Appis A, Feinstein SB, Williams Sr. KA. In-hospital statin underutilization among high-risk patients: delayed uptake of the 2013 cholesterol guidelines in a U.S. cohor. Hospital Practice. 45(1), 2017. Cho SH, Frtiz T, Khaghani A. Traumatic Pseudoaneurysm of the Outflow Graft Resulting from a Disconnected Heart Mate II LVAD Distal Collar. J Cardiol Cases. 2016 Jun; 13(6):178-180. Mueller L, Cho S, Fritz T, Khaghani A. Left Ventricular Assist Device Placement through Left Thoracotomy in Difficult Scenarios. Int J Clin Cardiol. 2016 Jan; 3: 69-72. Sattler M, Jones E, Clavijo L, Mehra A, Hindoyan A, Matthews RV, Tun H, Shavelle DM. Gender differences in patients undergoing percutaneous coronary intervention for acute myocardial infarction at a safety net hospital. JACC: Cardiovascular Interventions. 2017; 10(3): S12-S13. Wolfson A, Yousefian O, Short L, Talmor G, Y. Qiu J, Fong M, Doshi R, Grazette L, Saxon L, Shavelle D. Effects of Respiratory Variation on CardioMEMSTM HF Measured Pressure Values: Comparison of Device-Calculated and Visually Inspected Pressure Waveforms (abstr). Journal of Cardiac Failure. August 2016. Vol 22, Issues 8, Supplement, Page S80. Ghashghaei R, Sabet A, Yousefian O, DeMaria AN. Systolic Aortic Regurgitation: Prevalence, Mechanism, and Prognostic Significance (abstr). European Society of Cardiology. 2016; p5533. Wong D, Yousefian O, Auger W, Dittrich T, Madani MM, Daniels L, Raisinghani AB, DeMaria AN, Blanchard DG. Systolic velocity of the tricuspid annulus decreases after pulmonary thromboendarterectomy in patients with chronic thromboembolic pulmonary hypertension (abstr). Circulation. 2015;132:A12826. Zhang B, Nguyen NH, Yee BE, Yip B, Ayoub WS, Lutchman GA, Nguyen MH. Treatment of acute hepatitis C infection with pegylated interferon and ribavirin in patients co-infected with human immunodeficiency virus: a systematic review and meta-analysis. Intervirology 2015; 58(4): 242-249. Zhang B, Nguyen NH, Yee BE, Yip B, Nguyen MH. Re-treatment of patient with chronic Hepatitis C genotype 4 infection with pegylated interferon and ribavirin: a meta-analysis. BMJ Open Gastro 2015; 2(1): e000057. Yee BE, Nguyen, NH, Zhang B, Lin D, Vutien P, Wong CR, Lutchman GA, Nguyen MH. Sustained virologic response and its treatment predictors in hepatitis C virus genotype 4 compared to genotypes 1, 2, and 3: a meta-analysis. BMJ Open Gastro 2015; 2(1): e000049. Dong R, Wang X, Wang H, Liu Z, Liu J, Saavedra JE. Effects of JS-K, a novel anti-cancer nitric oxide prodrug, on gene expression in human hepatoma Hep3B cells. Biomedicine & Biopharmacotherapy. 2017 Apr; 88:367-373. Tuchman A, Yen C, Liu J. MIS retroperitoneal vertebrectomy. In: Fessler RG, Sekhar LN. Atlas of neurosurgical techniques: spine and peripheral nerves. 2nd Ed. Thieme Medical Pub; 2015.